Nothing about Wolfenstein 2: The New Colossus is in danger of being too subtle, and this unbelievable scene starring Adolf Hitler is no exception. It sees hero William "BJ" Blazkowicz going undercover as an actor auditioning for the fuhrer... to play William "BJ" Blazkowicz. Yep, it's all gone a bit meta. Spoiler warning before you click, obviously. Hitler is portrayed as a coughing, spluttering mad man in a Hugh Hefner style robe, one who reacts very badly to finding out one of the actors is from Arizona. And then pees into an ice bucket. Basically, if you were worrying about the game in any way glorifying one of the most evil men in history you can rest easy. In case you've missed out on the somewhat timely premise of this sequel, it sees BJ take on the Nazi's in early ‘60s America. "We’re never trying to contain ourselves in craziness levels," says the game's narrative designer Tommy Tordsson Björk. "That’s not really what the ultimate goal is - because the goal is just the story, and if the story turns out to be crazy, that’s sort of a side effect then, you know?" 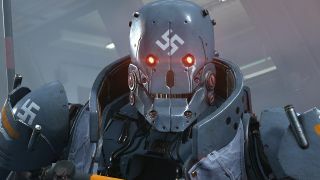 Wolfenstein 2: The New Colossus will be released on October 27 on PlayStation 4, Xbox One, and PC. We'll have a full and final review for you soon, but until then you can check out our review in progress that calls the game "ludicrous, smart, bombastic, and disgusting in equal measures."